UPDATE. Please see the original report “Unarmed Civilian Attacked by Israeli Army in his Home“, 21 April 2014. During the past two weeks, the Abu Jamal family in Khan al-Luban has experienced additional attacks, a road closure, and imprisonment. The son, Jimmy, who had been severely beaten by the Israeli army in an unprovoked attack, was released from the hospital the next day. His father was released from prison later that week. They were both then served with orders to report to the Israeli police station in the village by over 20 army and Palestinian Authority police. Jimmy was arrested on his way there and taken to Ofer Prison in Ramallah where he was held until his release on bail. During his time in prison, he experienced additional beatings and was tortured, breaking his arm and hand. IWPS and ISM volunteers have stayed with the family on a semi-permanent basis. The road connecting the family farm and surrounding illegal settlements circling their land at the top of ridges has now been blocked for road work. There is fear that the road widening project is a ruse to help illegal settlers steal the beautiful farm land and spring belonging to the family. The family continues to worry that their house or other structures on the property will be demolished. When IWPS volunteers arrived at the farm on Saturday 3 May, we found Jimmy, newly released from prison, alone and locked in the house with a hand splint made of a ballpoint pen and electrical tape. Other team members had to leave unexpectedly after another incident at the farm. Now the family are bravely recovering with the father painfully walking, the mother working despite her injuries and the 15-year-old recovering, but uncharacteristically sad. The farm is beautiful, but Abu Jamal is very upset that wild pigs destroyed fields he has been cultivating for months. It’s common practice for the illegal settlers to release the pigs, and poisonous snakes, to Palestinian villages and farms. The farmers are then fined or arrested if they kill the pigs. 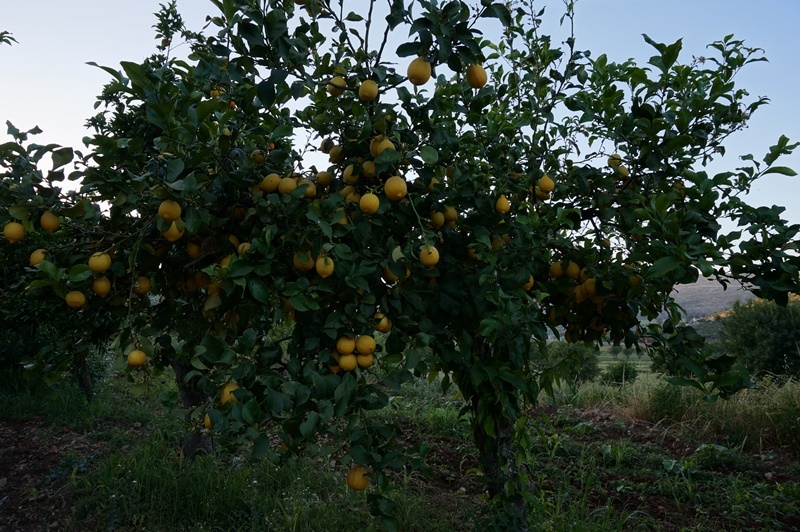 Lemon tree in the family’s farm. Personally: During our times on watch, we work on Arabic and English language respectively, talk with the family, try to help with chores, and watch for every settler car that goes by (yellow license plates) or for an Israeli army officer or villagers who have been going after this family. Meanwhile, Palestinian villages are under attack by the Israeli army across the West Bank, kindergarten-age Palestinian children are arrested and traumatized, and settlers attack small villages as the occupation plays out its genocidal aims with impunity.